It was in the late eighties when one of the premier catamaran sailors of the 1960s era told this story, "It was in 1968 that this guy came to me and asked my advice about this little, ugly catamaran. I told him to stick with his day job - no one would ever go for a boat like that! Well! That guy was Hobie Alter! So, don't ever listen to my advice." It was around that time that LIFE magazine did a big spread on the Hobie Cat. The world went wild and Hobie became a household word. And, in a short, swift time it did what devout multihull enthusiasts had been attempting over the past 10 years - make the word "catamaran" not such a dirty word. 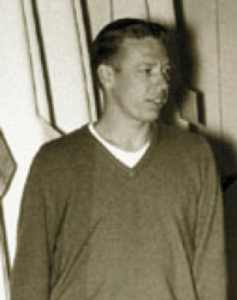 It was in the 1950s that a teenage Hobie Alter became very interested in surfing - a sport that was big in the Hawaiian islands and catching on in California. He was a tough and strong competitor in surfing events, but really made a name for himself in the building of surfboards. Never satisfied, Hobie then got into the skateboard business, and then the apparel business. Soon he had shops around the country. 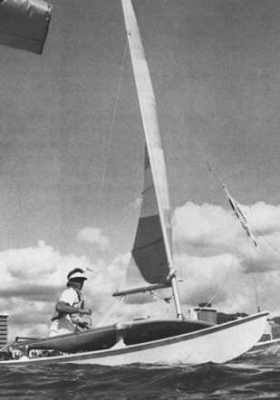 Then in the late sixties, Hobie and his buddies got interested in catamarans and designed the first of their sailboats - the Hobie 14. They were looking for a lightweight boat that one person could drag down to the water and launch through the surf. And they achieved it. The price of this new-idea cat was only $1000. It could be easily trailered or cartopped, but could also be quickly disassembled and put in a car or van. Within a few years the Hobie 14 became the largest class of cats in the world. An organization was formed to build an infrastructure for solidarity as was never done before. National and World Championships were organized. And with all this came great sailors. One such sailor was Stan Woodruff, who had just won the Shark Nationals. He sold his Shark and bought a Hobie 14. He is still sailing Hobies. 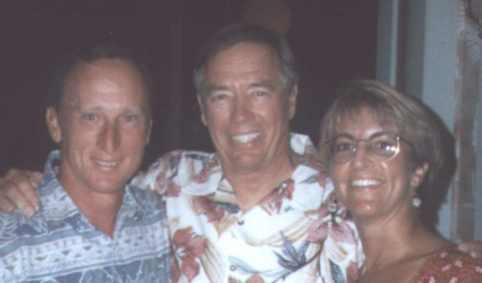 He and his wife, Sharon, are to this day very active in the Hobie 16 Class. He said, "It's a great little boat and the competition is awesome." The Hobie 16 came out in 1971, grew to a huge class, and is still the largest class of cats existing in the world. This design is the boat of choice for the ISAF World Championships. Still never satisfied, Hobie introduced the Hobie 18 in 1976. This class also prospered. It was the first boat with boards and high-aspect sail plans. This attracted many of the hard-core cat sailors of the 60s and 70s that believed in high-performance. While this design was not the best and foremost in technology, it still had most of the strings to pull. At this point Hobie had pretty well unified everyone that was interested in multihulls into his camp. And that was as it should be - he made the world become aware of the virtues and fun in sailing a multihull. Proving his versatility in his thinking, Hobie then started building radio-operated glider airplanes. And apparently to prove that he was a free thinker, he designed a very good monohull racing boat - the Hobie 33. This class is still large and very active - they had one of the largest classes in the recent SORC Regatta held in Miami earlier this year. What could Hobie have forgotten? Of course, a powerboat. So in 1984 he introduced the Hobie Skiff. This was a great little runabout that could really take a beating. This powerboat was able to hold up to a 50 hp engine, was self-bailing and had great capacity. This boat is still the workhorse coach boat used by Rick White's Sailing Seminars. In 1985, The Hobie 17 came about. The thought was to have a single-handed catamaran, but with the latest in technology. The design had boards and high-aspect ration Mylar sails with hiking wings such as used by the Australian racing boats. Then in 1988 the Hobie 21 came out and won "Boat of the Year" by Sail Magazine. It also became the boat of choice for the ProSail Circuit - the only professional sailboat racing organization of any success. Hobie is now residing in Idaho, where the entire family is busy with Hobie Apparel. 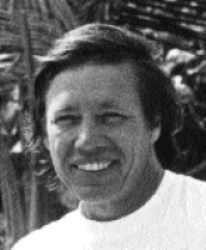 Many thanks must go out to this pioneer in the multihull field - he made the universe look at us. Many not only looked, they joined.